Set on 3 hectares we have something for everyone, Jumping cushion, ball court, indoor heated pool (closed Victorian 3rd school term) complimentary BBQs throughout along with a fully enclosed camp kitchen, toddlers playground, games room, free 200mb WIFI, laundry facilities (coin operated), Infant bathroom, kiosk, secure boat storage area – $3 per night, modern amenities with accessible bathroom, dump point. Grassed powered ensuite powered sites. 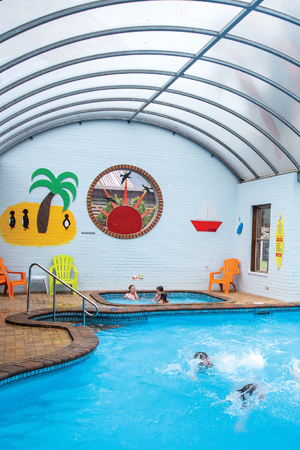 Over the years we have grown to ensure we are the ideal family holiday park whether in a tent or caravan, here for a short break or wanting a relaxed holiday in one of our self contained cabins, new accessible cabin or our luxury two story town-houses. With a perfect location; 100 metres to the beach, 200 metres from a boat ramp, 2 kilometres from the town centre and from 10 minutes from all the local attractions: why go anywhere else!